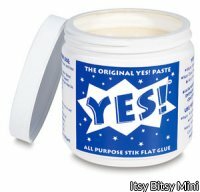 This paste is highly recommended for applying Itsy Bitsy Mini wallpapers. Used by museums in the preservation of paper artifacts and books, this adhesive will ensure enjoyment of your dollhouse for generations. This adhesive will not warp or curl paper. It dries clear. It is non-toxic and acid-free (neutral pH). This paste can also be used to apply carpeting to dollhouse floors. It can be used to bond Paper, Wood, Cloth, Leather, Cork, Glass and Metal.